The are a number of very different types of lawnmower and when choosing your new lawnmower you will need to consider price, the size of your lawn, how easy it will be to push, the quality of cut you require and much more. How often will you use your Lawnmower? What size of lawn do you have? Do you want stripes on your lawn? Brand? – Do you prefer a recognisable brand such as Qualcast or Flymo? Reviews of Cylinder Lawnmowers. 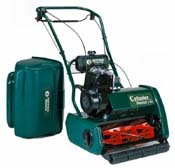 You cannot do much better than buy a good cylinder lawn mower as that is the best type of lawn mower to cut your lawn with. A rotary lawnmower just cannot produce the quality of cut grass. With a cylinder lawnmower, as the lawn mower goes forward, either pushed by you or under its own propulsion, a horizontally mounted cylinder rotates with a series of cutting blades on its surface trimming the grass to the desired height. As in most areas of life, you get what you pay for and the main disadvantage of a cylinder lawnmower is the cost. However, you should be able to find a basic electric cylinder mower costing you around £75 and with a bit of work sould give you the stripes on your lawn you have always wanted. Reviews of Rotary Lawnmowers. A rotary lawnmower cuts the grass using a rotating blade. 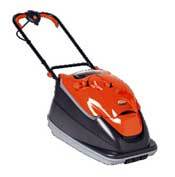 This blade hacks at the grass and does not produce as good a cut as a cylinder lawnmower. However, a rotary lawn mower will do a good a job and it will do an even better job if it has a roller on the back. 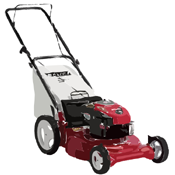 Rotary lawn mowers will easily cut your grass at the first cut of the Spring when its a little too long. In terms of price, rotary lawnmowers are considerably cheaper than cylinder lawnmowers, in both petrol and electric models. 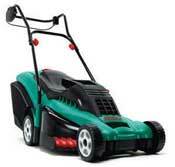 Reviews of Electric Hover Lawnmowers. If you are looking for a very easy to push lawnmower and a very reasonably priced lawnmower, a hover mower could be for you. The cutting method is the same as for a rotary lawn mower. The main difference is in the design of the skirt that surrounds the cutting blade. The rotation of the blades creates a down draft and the escaping air lifts the whole of the lawn mower off the grass surface so that it floats above it. You can mow from side-to-side with a hover lawnmower rather than forward and backwards if you wish. Reviews of Ride-on Tractor Lawnmowers. 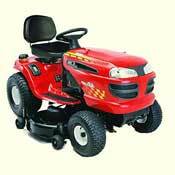 You will need to consider a ride-on tractor lawnmower if you are considering cutting larger areas. If you need to cut long grass in paddocks and orchards even in the wet. They can mulch, tow and drive powered accessories. Reviews of Robotic Lawnmowers. If you don't enjoy mowing your lawn and if your lawn is not too large a robotic lawnmower maybe just for you. Once a device of the future, robotic lawnmowers are now a reality. These battery operated mowers come complete with a docking station, where they automatically recharge.